: a wistful desire to return in thought or in fact to a former time in one’s life, to one’s home or homeland, or to one’s family and friends; a sentimental yearning for the past. I think we’ve all experienced nostalgia at one point or another – we hear a song and remember our youth, see a picture and are instantly transported back to a different time, usually (although not always) remembering those times as better, gentler, kinder. Although often bittersweet, nostalgia counteracts loneliness, boredom and even anxiety. It is a reminder that life has roots and continuity, providing strength to keep moving forward. This painting, A Girl and Her Dog, is a commissioned piece, based on one woman’s memories of her childhood home. 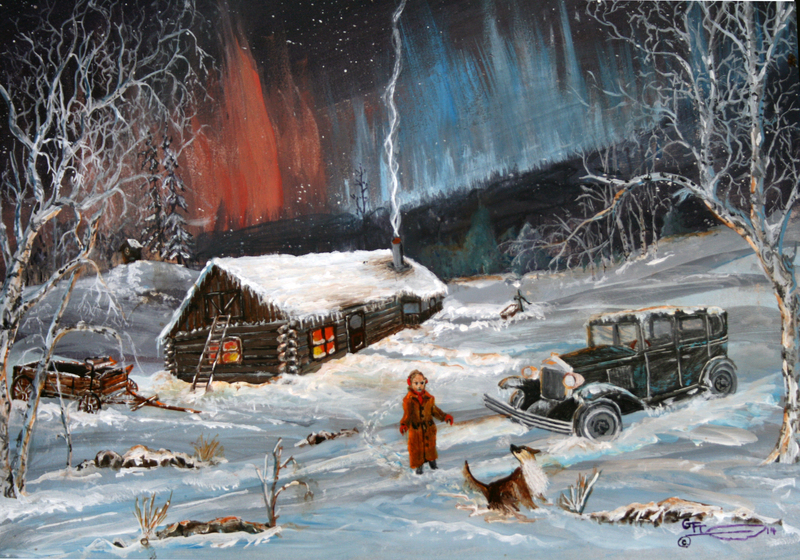 Growing up in a log cabin in Canada, she remembered vividly an old wagon, a ‘29 Chevy, her dog and the beautiful Northern lights. For her, this piece is a reminder of her youth, a time when things may have seemed simpler, a time long past. I’m happy to say that she loves the painting and the nostalgia it evokes.